What’s next for Stan, Kyle, Cartman, and Kenny? Has the South Park TV show been cancelled or renewed for a 23rd season on Comedy Central? The television vulture is watching for the latest cancellation and renewal news, so this page is the place to track the status of South Park season 23. Bookmark it, or subscribe for the latest updates. Remember, the television vulture is watching your shows. Are you? 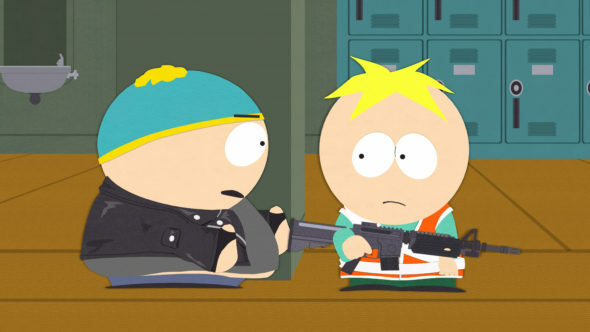 The 22nd season of South Park averaged a 0.50 rating in the 18-49 demographic and 861,000 viewers. Compared to season 21, that’s down by 51% and 25%, respectively. Find out how South Park stacks up against other scripted Comedy Central TV shows. South Park has been renewed through its 23rd season which will debut TBD. Will it continue past that point? Stay tuned for further updates. You shouldn’t have to spend your time wondering if South Park will be cancelled or renewed, because Comedy Central renewed it through season 23, back in July of 2015. Still, even renewals can be cancelled, and prior to this season, they released a trailer demanding their own cancellation. I’ll keep an eye out for news, just in case that joke turns out to be serious. Subscribe for free alerts on any South Park cancellation and renewal news. What do you think? Are you happy the South Park TV is renewed through season 23? How would you feel, if Comedy Central cancelled this TV series, instead? I love South Park prob.give seasons off the top of my head 1-17a 10 and seasons 18-22 a 9 when all the PC. principal and all the other stuff started but don’t get me wrong there all great I would really hate it if it ever got cancelled best show on TV. I love South Park at first I didn’t give it a chance now I think I watched every episode at least 10 times best show ever.i like some episodes better than others example, seasons bf.pc. principal and all that other stuff I give a 9 and like seasons 1 through 17 I give a 10.but love them all and would prob?if u stopped lol.thanks.